Connect RaceCapture/Pro to a power source between 9 and 24V. To fully support all devices and outputs, provide at least a 5A fused connection. The Analog Input Channels accept a 0-5v input signal (protected up to 40V). 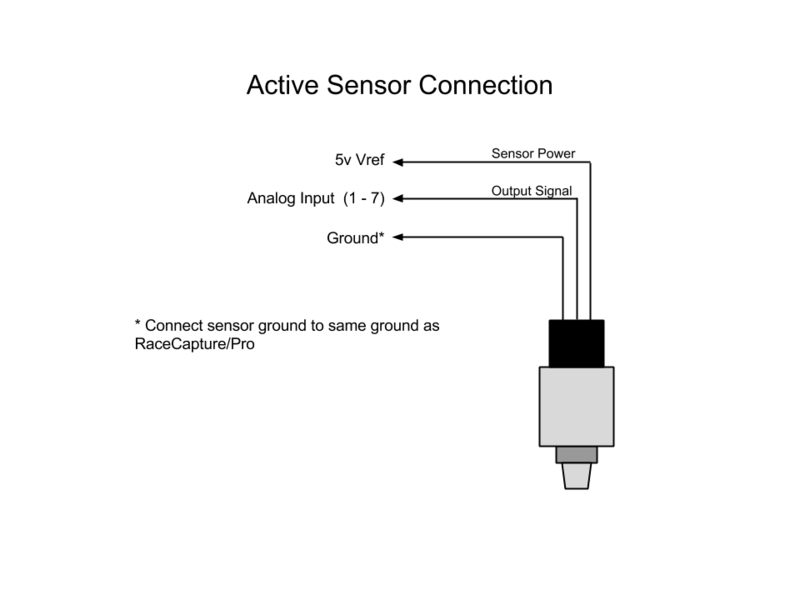 Connect the input from a sensor to the appropriate connection of the terminal block. 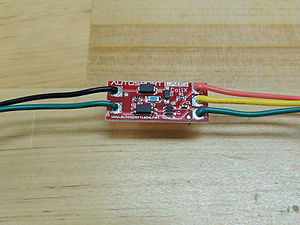 When connecting resistive style sensors, like many temperature and pressure sensors, one terminal of the sensor is connected to ground, and the other is connected to the Analog input, with a pullup resistor connected to the +5V Voltage Reference on the terminal block. A 2.2K resistor is recommended for most applications. 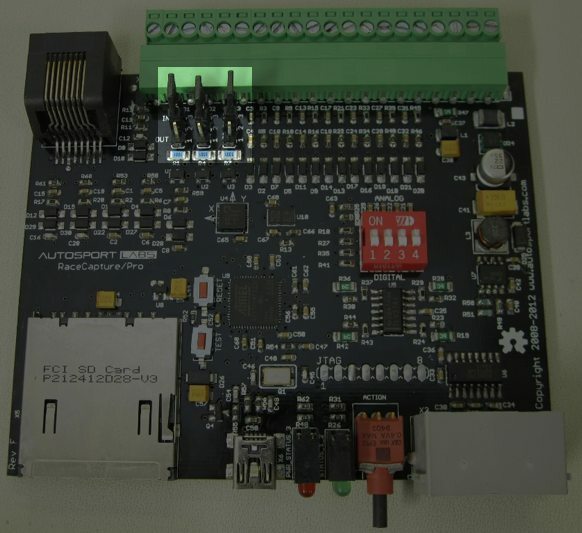 This output provides a 5V reference to be used with the Analog Inputs. Up to 50mA is provided to supply power to active sensors, pull-up resistors and other purposes. This reference output is protected against short-circuits with an auto-resetting fuse. If the fuse is active, a low or zero voltage reading may be observed on this port. To verify an over-current situation, test the voltage on the port without any load connected. Depending on configuration, these outputs provide a settable 0-5v analog output voltage, or frequency output where the pulse-width and frequency can be set. These outputs can supply 50mA each. Depending on configuration, these channels can accept either a digital input, or provide an output to control external devices. 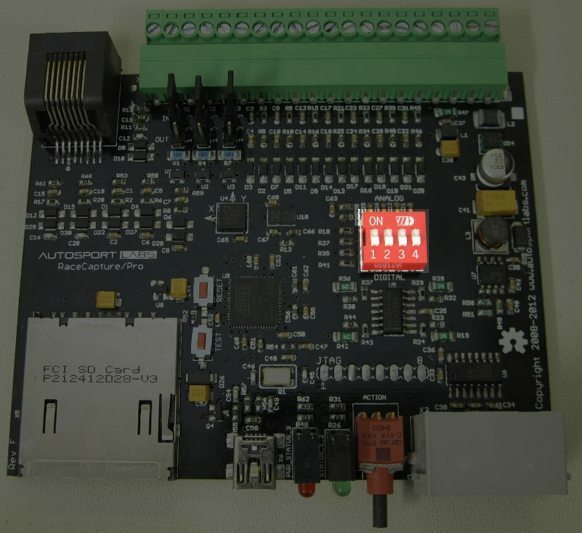 When configured for input, the channel accepts a 0-5v input (protected up to 45V). Each input channel has a built-in 10K pullup resistor connected to 5V. When configured for output, the channel provides an open-drain output that can drive 1A and is thermal / over-current protected with inductive load clamping. When the output is deactivated, a 1K ohm pull-up to +5v is present. These input channels can be used to time the duration between digital pulses for purposes of measuring RPM, shaft speed, and so on. The input accepts 0-5V (protected up to 40V). Each input has a built-in 10K pullup resistor connected to 5V. Do not connect the old-style tachometer signal directly to RaceCapture/Pro. This signal is typically sourced from a wire that connects directly to the (-) post of the ignition coil. These signals are 400-500v peak and can damage your RaceCapture/Pro hardware. You can use the CoilX sensor module to safely interface this high voltage RPM signal. See the CoilX page for more information. Newer style tach signals sourced from the ECU will likely provide a clean square wave signal and can be connected directly to this input. If unsure, observe the signal with an oscilloscope and/or consult technical documentation of your vehicle. The RJ45 connector to the right of the terminal block is used for the CAN/OBDII bus expansion module or other custom hardware expansion devices. The SD card slot is used to store datalogging sessions. 512MB to 32GB cards are supported. Indicates GPS Activity. Slow flash (1Hz) indicates GPS is actively acquiring. Fast flash (10 times per second) indicates GPS is locked on to satellites. Indicates SD card Logging Activity. The flash rate matches the channel with the highest configured logging rate. Press to manually start / stop a logging session. Note this may be overridden by any on-board scripts that may automatically start or stop logging. The ideal mounting position for RaceCapture/Pro is mounted flat (right side up or upside down), in the exact center of the vehicle. This gives the best effect from the built in Gyroscope, which measures Yaw (understeer / oversteer). The default accelerometer configuration assumes RaceCapture/Pro is mounted flat, right side up with the terminal block pointed towards the front of the vehicle. Other orientations are supported by changing the settings in the Software. See the Operation Guide for more information. This switch bank configures the 4 outputs for Analog or Frequency/PWM mode. To enable analog mode for a particular output channel, slide the switch for the selected channel to the 'on' position. For Frequency/PWM mode slide the switch to 'off'. 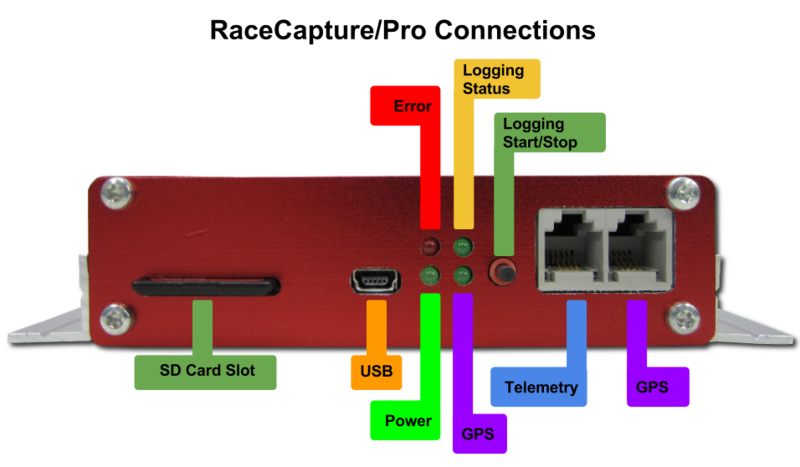 The reset push-button, if installed, is used as a hard reset for the running firmware.